Russian Salad is a healthy and nutritious recipe. It is the most typical salad mainly eaten in summer time, ideal for outdoor parties, and fabulous as cold starter. 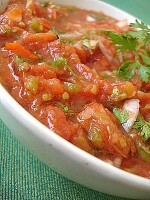 This is one salsa recipe I always rely upon and has always been a hit with friends, makes a good dip, dressing for a salad, serves as a sauce for spaghetti or a spread over an omlette. This recipe is neither too spicy nor too thick and works well for me. Simple n easy coleslaw recipe good for any occassion.